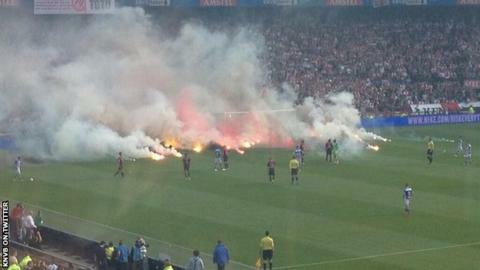 PEC Zwolle beat Ajax 5-1 in a Dutch Cup final stopped for 30 minutes after fans threw fireworks on to the pitch. Ricardo van Rhijn put Dutch champions Ajax into a third-minute lead. Moments later the game was suspended with fireworks and smoke bombs damaging the pitch and setting an advertising sign on fire. PEC Zwolle led 4-1 at the break, with Ryan Thomas and Guyon Fernandez scoring two each, before Bram van Polen added a fifth. It is the first major trophy in the history of Zwolle, who were only promoted from the second tier in 2012. Ajax are on the verge of winning a fourth consecutive Eredivisie title. They lead Feyenoord by six points with two games left. Dutch police said that 19 people were arrested before the game, which was played at Feyenoord's De Kuip in Rotterdam. But that did not stop the game being stopped for the first time almost as soon as it kicked off. Play then resumed, with Van Rhijn heading home but moments later it was again held up - this time for much longer - after more objects were thrown on to the pitch by Ajax fans. The players were taken off the pitch and Ajax coach Frank de Boer and former goalkeeper Edwin van der Sar, now the club's chief marketing officer, both pleaded with fans to stop. "Stop throwing fireworks on the field, it's dangerous," Van der Sar said. "If it happens again, the game is abandoned." When the game restarted, PEC Zwolle were ahead within seven minutes with teenage New Zealander Thomas scoring twice. Fernandez then scored twice to put them 4-1 ahead after 34 minutes. Van Polen added a fifth goal five minutes after the break and Thomas almost scored a hat-trick soon afterwards as Zwolle fans chanted for "10". No more goals came but it did not stop PEC Zwolle winning in their third KNVB Cup final - having lost in 1928 and 1977.